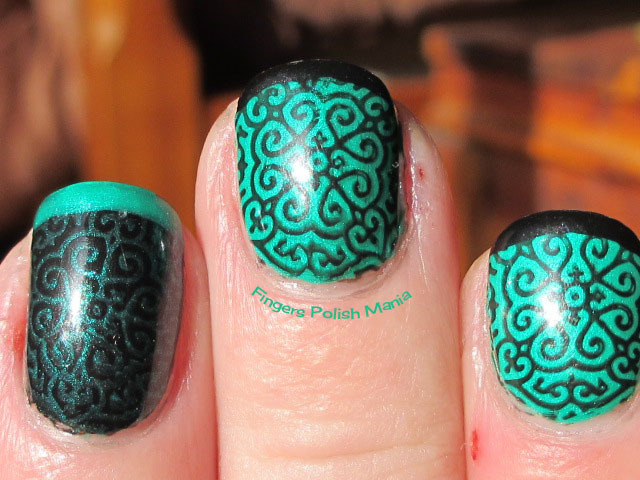 fingers polish mania: I've got something new! Hello people! Boy have I got something new to show you today! I am all sorts of excited! My parents came to visit this weekend and as always, I have home projects that I need my parents to help me with. This time on the list was to fix my leaky kitchen faucet. I had been wrapping paper towel around the pipe underneath the sink to contain it until it could be fixed. Also on the to do list was to clean my fish tank, clean out two shelves in my closets, clean the gutters and we also did some major shopping. How's that for a weekend? Unfortunately, the faucet could not be fixed so instead we got a new one and put it in. Here is your silly bottle shot for today with my new faucet. Isn't it pretty? I just love it! Thanks Mom and Dad! It's one of my Christmas presents early. 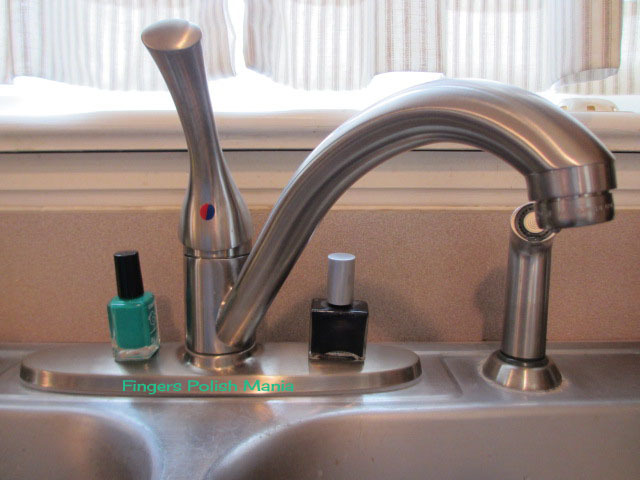 Sitting on the faucet is my new Chick Polish Gavie Green and Rescue Beauty Lounge Iconoclast. 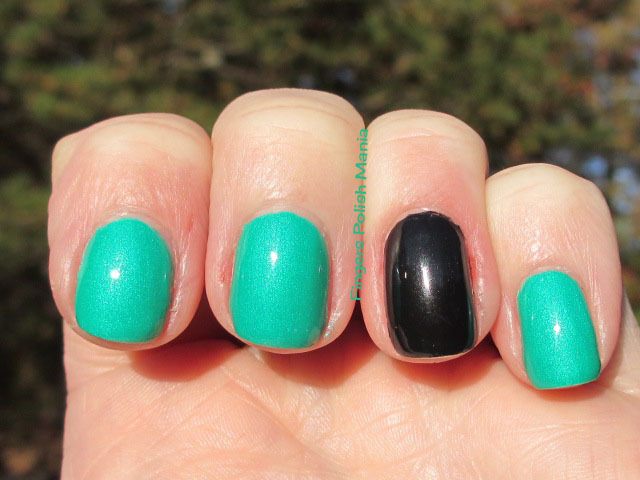 Oh yeah, I have discovered Chick Nail Polish! I am in love people. This brand does creme and shimmer like I love not a glitter in sight! Plus, in my order a cuticle oil was given to me to try. Now I know you're gonna say all cuticle oil is created equal. I got to tell you, this Tangerine oil smells heavenly and for me, it actually seems to absorb much better and faster than other oils I have tried. I'm a convert for sure. I have plenty of other colors from this brand to show you so stay tuned for that! 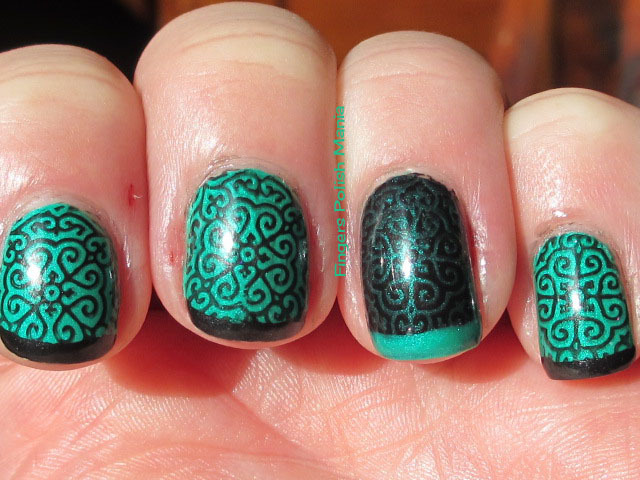 I started with Gavie Green, which actually dries to a rubber finish if you don't use top coat. 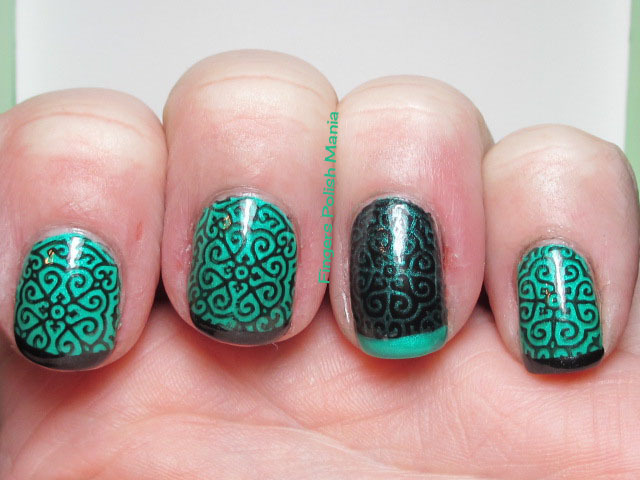 It is a loud bright green with gorgeous green shimmer. 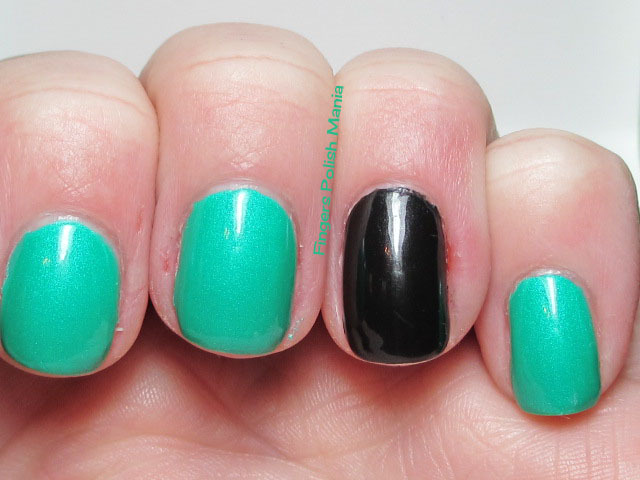 I did an accent nail with Iconoclast, which is a black with silver shimmer running through it. Here are the starting shots. Isn't this green gorgeous??? I couldn't stop staring at the shimmer on my nails. The way the sun hit it was just stunning. 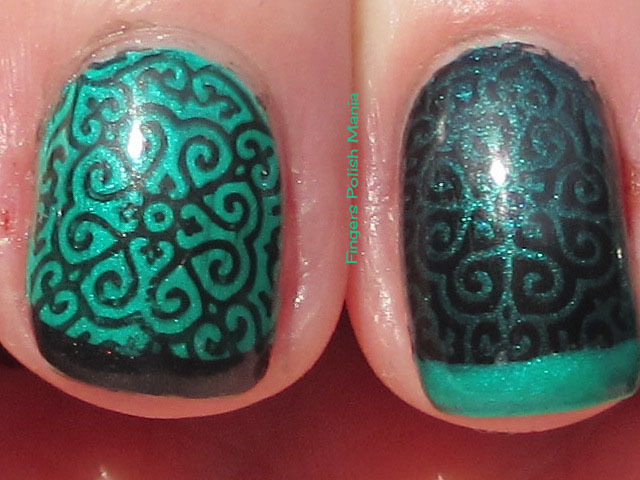 I then stamped with the opposite color again with my new DRK-C plate. Here is that step. It even stamps nice! Oh yeah people, I am in love with this Chick brand! I finished this up with my funky and here are the results! Please excuse the beat up fingers as I had just finished cleaning my fish tank when the sun came out. 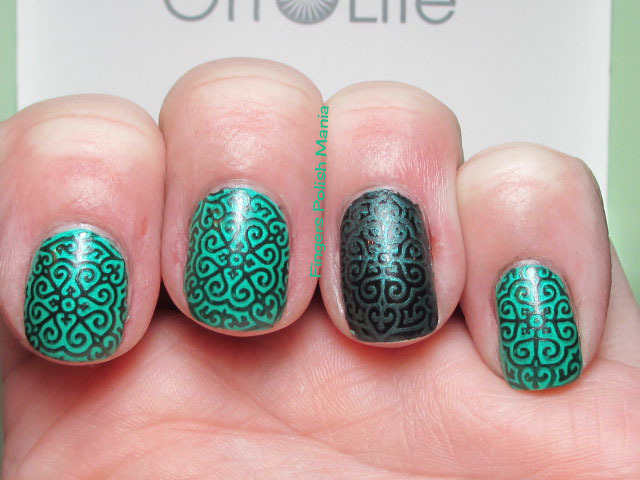 I had done this mani the night before and had not had any sun shots to show off this shimmer! So yeah this polish lasted through a thorough fish tank scrubbing!! You can get your own Chick nail polish here. It is really nice polish! As I said, I have many more to show you! Now I'm gonna go and enjoy my parents and my new faucet!